This article is about Matilda, Countess of Boulogne. For other Countesses of Boulogne named Matilda, see Matilda of Boulogne (disambiguation). Not to be confused with Empress Matilda. Matilda I of Boulogne (c.1105 – 3 May 1152) was Queen of England as the wife of King Stephen, whom she supported in his struggle for the English throne against their cousin Empress Matilda. During this period, Matilda played an unusually active role for a woman of the period when her husband was captured, and proved herself an effective general who managed to force their cousin to release him. Under the agreement that settled the civil war, her children did not inherit the throne. She was also Countess of Boulogne in her own right from 1125 until her death, when she was succeeded by her son, Eustace IV. She was born in Boulogne, France, the daughter of Eustace III, Count of Boulogne, and his wife Mary, daughter of King Malcolm III of Scotland and Saint Margaret of Scotland. Through her maternal grandmother, Matilda was descended from the pre-Conquest English kings. In 1125, Matilda married Stephen of Blois, Count of Mortain, who possessed a large honour in England. When Matilda's father abdicated and retired to a monastery the same year, this was joined with Boulogne and the similarly large English honour Matilda inherited. On Eustace III's death, Matilda and her husband became joint rulers of Boulogne. Two children, a son and a daughter, were born to the countess and count of Boulogne during the reign of King Henry I, who had granted them a residence in London. The son was named Baldwin, after Matilda's uncle, King Baldwin I of Jerusalem. The daughter was named Matilda. Baldwin died in early childhood and the young Matilda is thought to have died during childhood too, although she lived long enough to be espoused to Waleran de Meulan, Earl of Worcester. On the death of Henry I of England in 1135, Stephen rushed to England, taking advantage of Boulogne's control of the closest seaports, and was crowned king, beating his rival, the Empress Matilda. Matilda of Boulogne was heavily pregnant at that time and crossed the Channel after giving birth to a son, Eustace, who would one day succeed her as count of Boulogne. Matilda was crowned queen at Easter, on 22 March 1136. Matilda was a supporter of the Knights Templar. She founded Cressing Temple in Essex in 1137 and Temple Cowley in Oxford in 1139. Like her predecessor, Matilda of Scotland, she had a close relationship with the Holy Trinity Priory at Aldgate. She took the prior as her confessor and two of her children were buried there. In the civil war that followed, known as the Anarchy, Matilda proved to be her husband's strongest supporter. When England was invaded in 1138, she called troops from Boulogne and its ally Flanders, and besieged Dover Castle with success and then went north to Durham, where she made a treaty with David I of Scotland in 1139. After Stephen was captured at the Battle of Lincoln in 1141, she rallied the king's partisans, and raised an army with the help of William of Ypres. While the Empress Matilda waited in London to prepare her coronation, Matilda and Stephen's brother Henry of Blois had her chased out of the city. The Empress Matilda went on to besiege Henry of Blois at Winchester. Matilda of Boulogne then commanded her army to attack the besiegers. There was a rout in which the Empress's half-brother, Robert of Gloucester, was captured. The two Matildas then agreed to exchange prisoners and Stephen ruled as king again. Matilda died of a fever at Hedingham Castle, Essex, England, and is buried at Faversham Abbey, which she and her husband founded. Wikimedia Commons has media related to Matilda I, Countess of Boulogne. ^ Hilton (2008). Queens Consort, England's Medieval Queens. p. 86. ^ Hilton (2008). Queens Consort, England's Medieval Queens. pp. 89–90. Norgate, Kate (1894). "Matilda of Boulogne". Dictionary of National Biography. 38. pp. 53–53. Marjorie Chibnall, ‘Matilda (c.1103–1152)’, Oxford Dictionary of National Biography, Oxford University Press, 2004 . Duggan, Anne (1997). Queens and Queenship in Medieval Europe: Proceedings of a Conference Held at King's College London, April 1995. The Boydell Press. Hilton, Lisa (2008). Queens Consort, England's Medieval Queens. Great Britain: Weidenfeld & Nichelson. ISBN 978-0-7538-2611-9. Matthew, Donald (2002). King Stephen. Carnegie Publishing. Stephen, often referred to as Stephen of Blois, was King of England from 1135 to his death, as well as Count of Boulogne from 1125 until 1147 and Duke of Normandy from 1135 until 1144. Stephen's reign was marked by the Anarchy, a civil war with his cousin and rival, the Empress Matilda. He was succeeded by Matilda's son, Henry II, the first of the Angevin kings. Empress Matilda, also known as the Empress Maude, was one of the claimants to the English throne during the civil war known as the Anarchy. The daughter of King Henry I of England, she moved to Germany as a child when she married the future Holy Roman Emperor Henry V. She travelled with her husband into Italy in 1116, was controversially crowned in St. Peter's Basilica, and acted as the imperial regent in Italy. Matilda and Henry had no children, and when Henry died in 1125, the crown was claimed by Lothair II, one of his political enemies. Geoffrey V —called the Handsome or the Fair and Plantagenet—was the Count of Anjou, Touraine, and Maine by inheritance from 1129 and then Duke of Normandy by conquest from 1144. By his marriage to the Empress Matilda, daughter and heiress of Henry I of England, Geoffrey had a son, Henry Curtmantle, who succeeded to the English throne as King Henry II (1154–1189) and was the first of the Plantagenet dynasty to rule England; the name "Plantagenet" was taken from Geoffrey's epithet. His ancestral domain of Anjou gave rise to the name Angevin for three kings of England, and what became known as the Angevin Empire in the 12th century. Eustace III was the count of Boulogne from 1087, succeeding his father Count Eustace II. His mother was Ida of Lorraine. Adeliza of Louvain, sometimes known in England as Adelicia of Louvain, also called Adela and Aleidis; was Queen of England from 1121 to 1135, as the second wife of King Henry I. She was the daughter of Godfrey I, Count of Louvain. Adela of Normandy, of Blois, or of England, also known as Saint Adela in Roman Catholicism, was Countess of Blois, Chartres, and Meaux by marriage to Stephen II, Count of Blois. He greatly benefited from the increased social status and prestige that came with such a marriage. She brought with her not only her title, but a wedding gift of cash and other movable goods from the prodigious store of Anglo-Norman wealth. She was regent of Blois during the absence of her spouse in 1096–1100 and 1101–02, and during the minority of her son from 1102 until 1120. William I of Blois was Count of Boulogne (1153–1159) and Earl of Surrey jure uxoris (1153–1159). He was the second son of King Stephen of England and Countess Matilda I of Boulogne. Marie I or Mary was the suo jure Countess of Boulogne from 1159 to 1170. She also held the post of Abbess of Romsey for five years until her abduction by Matthew of Alsace, who forced her to marry him. 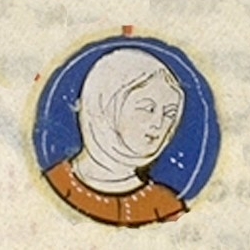 Mahaut or Matilda II of Boulogne was Countess of Boulogne in her own right and Queen of Portugal by marriage to King Afonso III from 1248 until their divorce in 1253. She was the daughter of Ida, Countess of Boulogne and her husband and co-ruler Renaud, Count of Dammartin. She succeeded her mother as Countess of Boulogne in 1216. She was the great-granddaughter of King Stephen of England. Matilda of Scotland, originally christened Edith, was Queen of England as the first wife of King Henry I. She acted as regent of England in the absence of her spouse on several occasions. Sibylla of Anjou was a countess consort of Flanders. She was the daughter of Fulk V of Anjou and Ermengarde of Maine, and wife of William Clito and Thierry, Count of Flanders. She was the regent of Flanders in 1147-1149. Renaud de Dammartin was Count of Boulogne from 1190, Count of Dammartin from 1200 to 1214 and Count of Aumale from 1204 to 1214. He was son of Alberic III of Dammartin, and Mathilde of Clermont. The House of Flanders—also called the Baldwins —was founded by Baldwin I Iron Arm, husband of Judith, daughter of Charles the Bald. The Count of Boulogne is a historical title in the kingdom of France. The city of Boulogne-sur-Mer became the centre of the county of Boulogne during the ninth century. Little is known of the early counts, but the first holder of the title is recorded in the 11th century.